Post-Impressionism is a term which was used to cover the development of art in France after Manet. We offer works by Henri de Toulouse-Lautrec and Paul Gauguin. Les Nabis were a group of Post-Impressionist artists who were influenced by the Symbolist school. 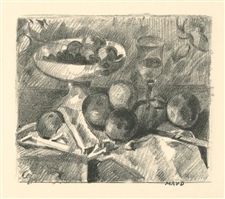 We have some very nice prints by Nabis artists Pierre Bonnard, Felix Vallotton, Edouard Vuillard and Aristide Maillol. Symbolism is also represented with original prints by Edvard Munch and art works after Symbolists Edmond Aman-Jean, Odilon Redon and Eugene Carriere. Fauvism evolved from Post-Impressionism and included Andre Derain and Maurice Vlaminck. 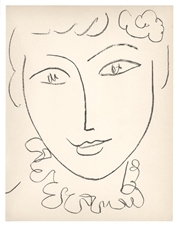 Henri Matisse, Georges Rouault, Raoul Dufy, and Georges Braque were also associated with The Fauves, and we offer prints by or after all of these artists. Medium: original etching and drypoint. Catalogue reference Schiefler 268, final state. 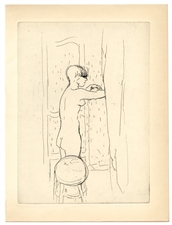 This original Edvard Munch etching was printed in Berlin in 1920 for Paul Cassirer. Plate size: 4 1/8 x 5 7/8 inches (105 x 150 mm) with good margins. Not signed. This is a fine impression on laid paper. Munch was associated with Die Brücke (The Bridge) and is the most famous member of that group of Expressionist artists. 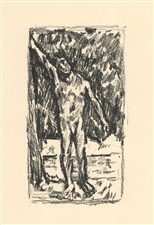 This is the first work executed by Munch after his nervous breakdown in the autumn of 1908, while a patient at Dr. Jacobson's clinic in Copenhagen. Paul Cassirer was an important German art dealer, who was instrumental in promoting various Impressionist, Post-Impressionist and Expressionist artists, including Van Gogh, Cezanne, Manet and Munch, among many others. 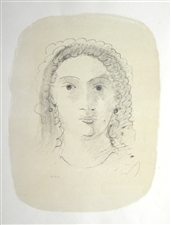 Edvard Munch original etching "Portrait Study"
Medium: original etching. "Portrait Study" is also known as "Head of a Man"; the catalogue reference is Schiefler 243. This etching was published in Berlin in 1917 by Paul Cassirer. Plate size: 4 5/8 x 3 3/8 inches (115 x 84 mm). Not signed. This is a nice impression on cream wove paper, and one of the few Edvard Munch original prints that is affordable. Condition: there is some rippling and foxing in the margin. 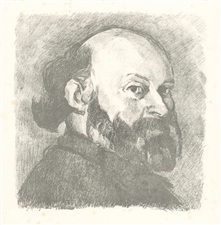 Edouard Vuillard original lithograph "Portrait de Cezanne"
Medium: original lithograph. Catalogue reference: Roger-Marx 51. 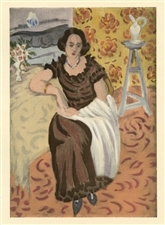 This is an interpretation by Vuillard of one of Paul Cezannes's own self portraits, published in Paris in 1914 by Bernheim-Jeune for the rare volume "Cezanne". 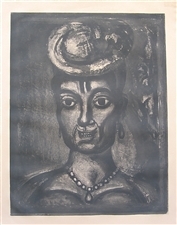 This impression is one of 400 printed on wove paper (from a total edition of 600). The image size is 9 3/4 x 9 1/4 inches (245 x 240 mm) and the total sheet with full original margins measures 15 x 11 inches (383 x 280 mm). Not signed. Condition: the paper is foxed, mostly in the margins (see the second photo). Fernand Khnopff original drypoint "Un masque"
Medium: original etching and drypoint. 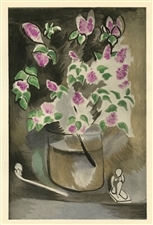 Printed in Paris and published in 1905 by the Revue de l'Art ancien et moderne. 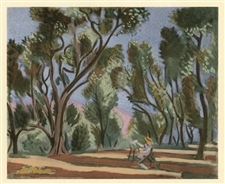 Plate size: 7 x 4 inches (175 x 100 mm). A nice impression on watermarked laid paper. Not signed.